In May of 2017, the San Diego Workforce Partnership was awarded $500,000 in Workforce Innovation and Opportunity Act (WIOA) governor’s discretionary funds to develop and implement a project that increases access, creates or enhances program structure and availability and provides supportive services within the local workforce system for California’s English Language Learner (ELL) population, which includes many foreign-born residents and those from non-English-speaking homes and backgrounds. 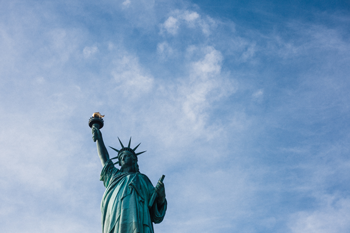 According to the California Workforce Development Board (CWDB), more than a third of California’s workforce is foreign born and often struggling with English language proficiency and educational attainment. SDWP works in collaboration with the International Rescue Committee in San Diego and the East County Career Center (Grossmont Unified School District), including adult education, on the ELL Navigator Pilot Program, which offers access to Individual Training Accounts (funding for career center clients to enroll in training), Class B truck driving, project management, building trades and construction, health care and placement in employment. The project began in July of 2017 and will continue through December of 2018. The goal of the program is to enroll 100 adult (ages 18 and up) ELL participants in the East Region of San Diego County and provide training programs to secure stable employment. 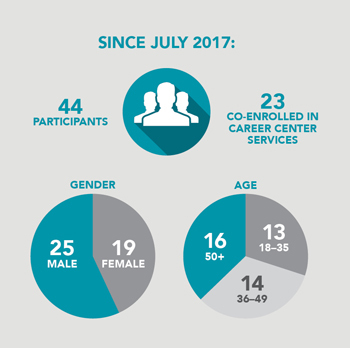 As of February 2018, a total of 44 participants (25 male, 19 female) have been enrolled into the San Diego ELL program, with 23 being co-enrolled into the career center for training and employment services. Eighty-nine percent of the participants are immigrants or refugees from Iraq, while others are from Afghanistan, Iran and Mexico. A small majority of the participants are over the age of 50 (16 total), with 13 in the 18–35 range and 14 in the 36–49 range. As this is a pilot project, SDWP is currently evaluating the program through a series of surveys administered to program partners—career center staff, adult education staff, and local community-based organizations—as well as scheduled focus groups with enrolled participants. SDWP found that 65 percent of the staff surveyed are proficient in a language other than English including Spanish (82 percent), Arabic (one percent) and a few who speak Somali, Italian, German, Chinese and Tagalog. The same staff members believe that at least 69 percent of the adults accessing workforce services are from the ELL population, and overall would like more assistance to training, language services and translators, and community resources—including employers who hire ELL adults. SDWP will continue working with staff and participants to gauge the effectiveness of the current system of career centers and community-based organizations and whether the partnerships can better serve certain populations, such as ELL. The CWDB also funds coordinated technical assistance along with a mandatory third party programmatic evaluation at the conclusion of the program.